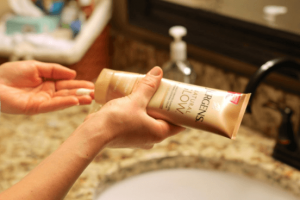 Home | Bath & Body | Jergens Natural Glow Line Review 2019: A Glowing Review? 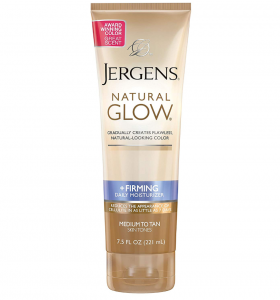 Jergens Natural Glow Line Review 2019: A Glowing Review? Welcome to another two part series. This series is a Jergens Natural Glow Line review. This line encompasses 9 differently products and because of that I’ve split it up into to two sections. Like so many women today, I too want beautiful healthy looking tanned skin year round. Especially in the summer time when I wear more revealing clothing and everyone gets to see how chalky white I can really be. The problem is I have never tanned well. I generally just burn badly; and when that terrible bright lobster-like color goes away, I have a brief tan that all too quickly fades. Wearing sunscreen everyday helps but sometimes can prevent my skin from getting any color. That’s where self tanners come in handy. They provide a nice color without the harmful effects of UV rays. I have never been a fan of tanning salons. I will not fry my skin on a tanning bed or subject myself to being sprayed by chemicals like I’m a car getting a new coat of paint. If you’re anything like me, affordable drugstore self-tanner products like Jergens Natural Glow can become very appealing. Promising to gradually build up a natural glow to your skin, such tanning products can open a world of possibilities to individuals who would like to give their skin a more natural looking tan without the need to be exposed to harmful ultraviolet (UV) ray damage or the fake salon offerings. Over the years I’ve tried various different self-tanners readily available in local drugstores and retailers. Most I really did not like. They irritated my skin, or caused it to have a really unnatural orangey tinge. The smell was almost always disgusting. I had nearly given up when a friend told me about Jergens. I had mixed feelings about these products at first. They seemed to work better, and had less of a gross smell, but that scent was still there, and try as I might to disguise it, I was never fully happy with it. That is, until they reformulated their recipe and now the smell is much better in comparison. I’ll write more on this a little later in the article, but this means that if you’ve tried it in the past and not been happy with the scent, you might want to give it another go and see if the new slightly fruity/tropical smell suits you better. Some of my friends love Jergens. Some do not. Since the chemicals in the products react differently with different people’s skin, and not everyone is careful about proper application, some have had the same bad experiences I’ve had in the past with other self-tanners. So keeping this in mind, make sure you experiment a bit to find the right product brand for you! As for me, I only use Jergens. 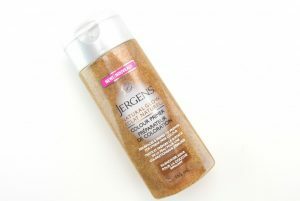 Most Jergens Natural Glow products are available in Fair to Medium and Medium to Tan formulations. With my pale skin I always use Fair to Medium, but if you’re darker, go for the Medium to Dark. It might sound counter intuitive to do that, but if you are fair, the Medium to Dark imparts a darker shade, that in my opinion is not very flattering for normally light skinned women. Obviously you must experiment a little to find which gives the best results for you personally, but from my experience and my friends, it will come from the Light to Medium. Let’s face it, really pale women are just not meant to have those deep dark tans, at least not without a massive amount of skin damage. The point of using this gradual tanner is that we want a natural looking tan, or as close to natural as we can get. So unless you’re planning on a fast back-and-forth vacation to the Bahamas, people will know that there is no way in heck that dark look is natural. With Jergens Natural Glow line products, you can achieve a smooth, soft, darker shade of skin tone without any tan lines. You can also use them to help blend existing unsightly tan lines. 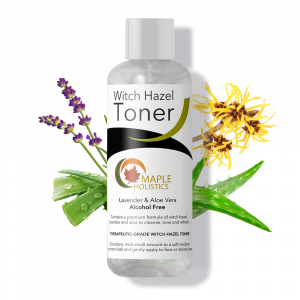 When applied properly and given time to absorb into your skin (between 10-15 minutes) the color does not transfer to clothing or furniture, and you won’t end up with a blotchy patches or streaks. Though if this does happen, they will easily fade in a few days so don’t get too nervous about trying Jergens self-tanners out, even if they turn out not to be optimal for you. Men can often get by without using any, but for most women, moisturizer is a must! Moisturizer acts as a protective barrier for your skin, keeping it hydrated, supple and healthy. I certainly will not claim that any of these Natural Glow line products are the best moisturizers, but I do think they are the best that come in self-tanners. Despite the differences between people’s skin types, most can benefit from the right type of moisturizer. Those that suffer from dry skin can certainly attest to this. Without a daily dose of hydration their skin would be flaky, itchy and tight. Those that have oily skin might use moisturizer less often, but they actually need it just as much. Because people with oily or acne-prone skin often apply drying products, their skin may start to produce more oil to balance it out. But using a light moisturizer can help keep skin in balance and cause it to produce less oil over time. If you have sensitive skin, you know that a good moisturizer can calm redness or flare-ups from skin issues like eczema. Some people are more sensitive to Jergens products, but you’ll be able to find this out pretty quickly and stop treatment if you find it to be detrimental to your skin. To better understand how Jergens Natural Glow works, it is important to consider the method and ingredients. 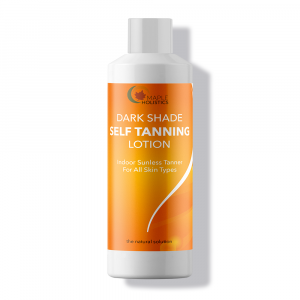 Self-tanners, like Jergens Natural Glow line, create an artificial darkening of the skin, but unlike an actual natural tan, the effect does not increase melanin production which neutralizes the vast majority of UV rays. It is an important distinction, because the purpose of a natural tan is to do just that, increase melanin pigment in the skin as a means to protect your body against harmful UV radiation. This is vital to keep in mind for anyone who spends significant time outdoors. Instead, what occurs with self-tanning is a tinting effect that is created through enzymatic reactions which are somewhat similar to the chemical that makes bananas and apples turn brown when they are peeled/cut. I wish these products were made of more natural ingredients, but I think it is still better than a spray-on tan or baking in the sun. 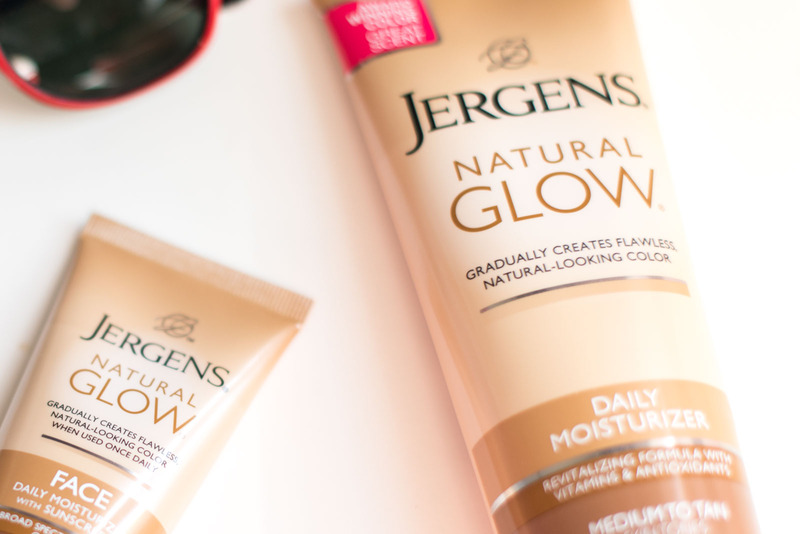 The ingredients in Jergens Natural Glow vary from product to product within the line. However, the key ingredients that appear in most of them are erythrulose and dihydroxyacetone (DHA). They are common chemicals in many self-tanning products, and are not exclusive to the Natural Glow line. These are the two ingredients responsible for the darkening of the skin. When applied, dihydroxyacetone reacts with dead cells in the skin’s surface (epidermis) to temporarily darken the skin and simulate a tan. This change lasts only a few days from the initial application, because we are always shedding dead skin cells. 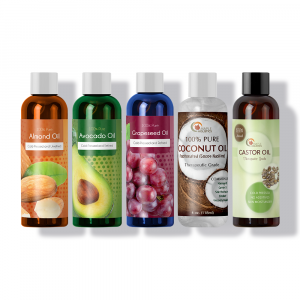 Other ingredients in some these products include vitamin E, to fight free radical damage; glycerin, to moisturize the skin; collagen and elastin, ostensibly to help firm up the skin; colorants, to enhance the immediate effect of the products; and natural mineral oil, among others. Exfoliating before applying a tanning lotion helps to sustain a natural tan. Although not a self-tanner this scrub is meant to be used in the shower prior to the self-tanner application. Why? As stated above, the key ingredient in the self-tanner is DHA, which interacts with your upper skin layer to cause the “tan.” If you don’t exfoliate prior to application, your dead cell covered skin will slough off sooner and you’ll lose that tan you so painstakingly applied. You also run the risk of your tanner not applying smoothly and therefore ending up streaky, because some parts of your skin have more dead cells than others. So make sure to clean off that skin beforehand with a scrub, and then apply your tanner. I can’t stress this enough- Always exfoliate! Just like you wouldn’t paint a wall without priming it first, do not use self-tanner without a proper exfoliating primer so you can get the best results. I love shower scrubs. I happen to really enjoy exfoliating in general because I like the soft fresh feeling of my skin afterwards. As far as scrubs go, this is a pretty decent one. It works at a chemical level with its amino fruit extract complex and salicylic acid, and it does have some granules in it (I believe from crushed apricot pits), but I usually prefer my own home-made sugar scrub. Still, my skin did feel smooth after using it and showering. 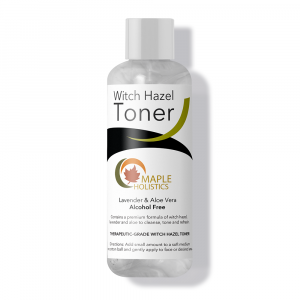 Bottom Line: It works fairly well and, as with any exfoliation, my tanner applied well afterward. I just personally would like a product, or home-made concoction, with a bit more scrub, and my preferred scents, so I will likely not purchase this in the future. Is it better than other readily available commercial body scrubs for self-tanning purposes? Apart from the small granules, I’m not sure. However, if you’re looking for an affordable store bought scrub, this really isn’t bad. If you’re like me, you love the tan look, but don’t want to get more wrinkles and UV exposure spending long periods in the sun. Fortunately, sunless tanning products have been created for consumers like me. 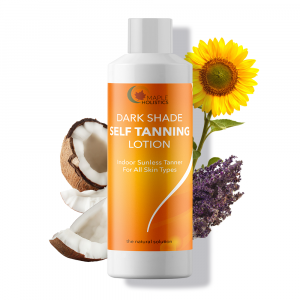 If you’ve ever tried sunless tanning products before you may have ended up orange and streaky, but have no fear of these products, the tan is gradual, so you can stop applying the lotion at the first hint of orange. For years I’ve been using the original Natural Glow Daily Moisturizer, but why not have one that also firms and reduces the appearance of cellulite? Although it is not immediate and not life-altering, I’m still going to use the one that could give me added firming benefits, however minor! Since they are essentially the same product this review about the + Firming really encompasses both. Beginning in my mid-twenties, my summer skin ritual has included Jergens’ Natural Glow Moisturizer. Of all the self-tanning moisturizer products, this one gives my whitey-white skin just enough summer color without fear of streaks, smears or splotches. The slow build-up of color appears more natural than other self-tanners, and when I stop using it, it wears away evenly. As happens when you age (and have three children, bless their little hearts), my skin isn’t as tight as it used to be and I’m finding that a little added firming goes a long way. So you can imagine how excited I was about Jergens Natural Glow + Firming Daily Moisturizer, when it first came out. Like the regular version, this product gradually creates nice natural-looking color with a subtle skin-darkening process. Though some tightness is felt almost immediately, in about a week or so you’ll experience slightly firmer skin with less noticeable cellulite, stretch marks and improved elasticity. Even though the build-up is gradual, it does not take forever to show up. It is roughly about a week to 10 days to get to your desired skin-tone, and then it’s easy to maintain, even if you skip a day now and then. The best results, though, come from daily use. While most of us are inclined to use this + firming just for our legs, I would suggest using it on your entire body for the firming aspect. Even if you exercise a lot as you age there will inevitably be some change in your skin texture and firmness, which this product seems to help with, though it is not on par with some of the more expensive firming creams out there. With that being said, I’ve found that even those more expensive products do not always deliver what they promise. I think it’s just our continuous run after the fountain of youth that keeps us trying and using these creams even though they cannot truly turn back the effects of time. Still, we remain ever hopeful and I have friends who claim this product has had long lasting helpful effects. I mentioned earlier the new Natural Glow Recipe. There is a little sticker on the package that says “Finally Great Color Without Odor” – This is not really true, but I think they meant in comparison to their old formula and many of the other self-tanning lotions out there today. There is still a subtle scent, but it’s not offensive and certainly not self-tanner (DHA) smelling at all. The subtle scent is actually kind of nice. Here’s a small trick I use to enhance the smell; add in a little bit of Vanilla scented oil free lotion. Most of my friends seem to agree that Jergens’ odor isn’t too bad, and that it has markedly improved over the years. Still, some say that they can’t tolerate it; reactions definitely seem to depend upon one’s personal sensitivity to fragrance. Also, different people’s skin have varying levels of reaction to DHA, and thus any given tanning product may have more odor on one person than another. I love Jergens Natural Glow Daily Moisturizer + Firming self-tanner mainly because it is a gradual tan that looks natural and feels great. Sure there are times I want instant results – or results within hours – but on a normal basis it’s nice to build that tan as you would if you were on vacation. As for the firming effect, I haven’t really noticed a huge difference in my skin. I’m very lucky in the fact that the cellulite that I do have is really not terrible and not very noticeable, but having tan skin does make cellulite even less visible and my skin does feel slightly tighter. Sadly, this doesn’t seem to have had any effect on my stretch marks. Applying this moisturizer is simple. I make sure to exfoliate well in the shower, and then pat dry my body. I put on rubber gloves and use a small coin sized amount on each area that I work on. I always start with my face so it dries the quickest, then go all the way down to the tops of my feet and work my way up; knees, then my thighs, belly (if I’m baring it), then arms, and lastly my chest, shoulders, and neck. In order to ensure a smooth and even application pay attention to trouble spots such as ankles, back of knees, knuckles etc’… basically anywhere where dead skin cells build up between folds of skin. While the rest of the lotion dries I do my hair and make-up. By the time I’m done (usually 10-20 minutes) it’s all dry. Like all Natural Glow products, you must let it dry before you get dressed. If you don’t you can stain your clothing and get streaks. It takes my skin usually about 6-8 days of continuous use (once per day) to start getting a nice golden bronzy color. Keep in mind that you will get a little darker from the actual sun when using this in the summer as opposed to the rest of the year, so just keep that in mind when applying. You’ll want to leave in that room for the real tanning effect that invariably happens when you’re out and about in the sunshine. Remember, everyone’s skin reacts differently to tanning products. The best way to find the sunless tanning product that will work for you is by trial and error. All the Natural Glow line lotions have a small amount of micro-fine glitter in them. Maybe the people in the lab thought this would add to the glow, and I’m sure some might like this effect, but I personally do not. Luckily this washes off easily. Honestly I didn’t even notice until my 6-year-old daughter Amy hugged me tight one day and said “mommy your legs have glitter on them!” Well I’ll be darned. Not so noticeable, but they did indeed glitter a bit. I probably would have loved this in middle-school, but those days are FAR behind me. Read all about It Cosmetics while you’re here at Maple Holistics! For me the original Natural Glow moisturizer has always been pretty good, with color building gradually but noticeable even after the first day. Now with + firming, the lotion makes my skin noticeably smoother and the color remains as even as it always has been. I did notice that my skin felt a tiny bit firmer, but maybe that was just wishful thinking. Thanks for reading so far and I hope you’ve enjoyed and gotten some great information. Please continue reading my review on the Natural Glow line products in part 2 of this article. See you there!